Commissario Guido Brunetti is the main character in Donna Leon’s series, which we love for the evocative images of water-logged Venice, the masterful crime scenarios, and Brunetti’s thoughtful inner voice. Ranging from downtrodden pensioners to wealthy villa owners to ineptly corrupt bureaucrats, Leon’s secondary characters lead Brunetti through complex situations imbued with Italian history and passion, but often tainted by modern Italy’s ineffectual political system. 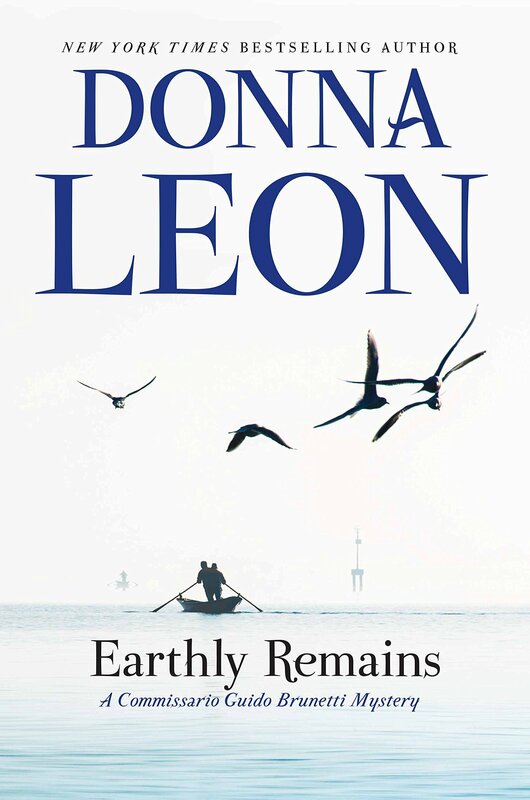 Earthly Remains is the latest Brunetti mystery and it departs from the usual pattern. The first half of the book is Brunetti’s slow rediscovery of himself after he fakes a heart attack to prevent a young officer from hitting a suspect. The trip to the hospital, however, reveals stress-induced high blood pressure. Under doctor’s orders to take a break, he heads to the island of Sant’Erasmo in the Venice laguna, the often swampy waters surrounding the Venetian archipelago. There he’ll resume a hobby from younger days: rowing in the shallow Venetian boats called puparín, shorter than the more well-known gondola, in which the oarsman stands. His rowing mentor will be Davide Casati, the caretaker of the villa in which Brunetti stays and friend of Brunetti’s late father. Back in the day, Casarti and Brunetti senior won an important rowing race and this provides a quick bond between the cop and the caretaker. For 10 days and the first half of the book, the two men take the reader on a wonderful boat tour of the still-wild places around Venice. Apart from rowing, Brunetti reads ancient philosophers, loses some weight, and we get a clearer picture of the man than in other books in the series. At the same time, Casati intrigues us. Despite all the hours spent with Brunetti on the water, Brunetti learns little besides he is a beekeeper, with hives dotted around the islands and upset that many of the bees are dying. Just when I was wondering where the story was headed, Casati goes missing. Brunetti’s police instincts reawaken, and the second half of the book is his uncertain investigation into what all believe was an accident. The clues are well planted and the interrogation sequences some of Leon’s best. The ending was powerful, sad, and almost certainly true. Bottom line: a must-read addition to the Brunetti series and a wake-up call to anyone who wants to see Venice before it’s gone. About the reviewer: Carmen Amato writes stylish suspense and mystery, including the Detective Emilia Cruz police procedural series set in Acapulco and optioned for television by a US network studio. Emilia Cruz is the first female detective on the Acapulco police force, confronting Mexico’s drug cartels and legendary government corruption. Kirkus Reviews has called the books “consistently exciting,” with “danger and betrayal never more than a page away.” Visit her website at carmenamato.net to subscribe and get a free copy of the Detective Emilia Cruz Starter Library. Three chapters, two novellas, and one unforgettable cop.